I decided to get a little experimental this afternoon and do some baking. I was originally planning muffins but decided to tackle something a little easier in making it gluten free. 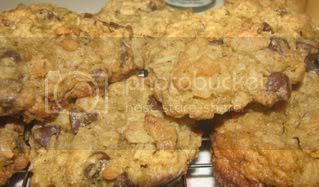 I scoured alot of recipes for both chocolate chip and oatmeal recipes before deciding on this one. To make it gluten free I used 100% Organic Quinoa Flour for the flour ~ easy, cheesy, right? Well, in my recipe style I modified it by using WF vegan Chocolate chips (1 cup) for the raisins and I used 1/2 c chopped pecans & walnuts. The end result ~ I will report back when I try them as I am still full from my lunch. However, a cookie did crumble when I was taking it off the pan (parchment paper is needed to make these for sure!) and I tried that. It was tasty! The Husband snuck a taste too and said they taste like a granola bar ~ ha, then again, he doesn’t eat oatmeal either. Don’t these just look good though???? « Vegan & Gluten Free Pad Thai~ Yum! They look so good! I’m dying to know how they taste. Yummmmmm…. I think they taste really good! The nuts are nice and roasted, the chocolate is amazing (you can’t even tell the chocolate is vegan) and they are crispy and chewy all in one. DH ate one and said they were just ok, but, like I said, he isn’t a fan of oatmeal. I gave some to his mom and told her to let me know what she thinks and I am polling my co-workers tomorrow. Suprisingly this was a really good cookie. I think even my kids would love it. The good thing about it you don’t need a glass of milk (less calories) like most cookies. I give it two thumbs up!!! Thanks for the review Rachel. I agree – they are good and seem to taste better the next day. I bet almond breeze would make them fabulous.